The New Nissan LEAF has today launched in Europe, with the Japanese car maker unveiling the vehicle at its Nissan Futures 3.0 event in Oslo, Norway. Nissan, who see the vehicle as an embodiment of its Intelligent Mobility vision, has redesigned the car to offer greater range and performance, as well as fit its ProPILOT driver assistance technologies, the latter using steering, braking and acceleration to assist the driver within single lane, low speed traffic and highway cruising scenarios. In addition, the new LEAF has also been equipped with Nissan's bi-directional charging system, meaning that when the vehicle is not in use it can feed its energy back into local power networks, such as homes and offices, as well as the energy grid thanks to company's Vehicle to Grid technology. Headlining the improvements on the new Nissan LEAF is, arguably, its improved range, which now allows a 235 miles (378km) on a single charge. When drivers do need to stop and recharge, they can do so via the European CHAdeMO Quick Charging network. The vehicle is fitted with a new 40 kWh Li-ion battery that can be charged from alert status to to 80 per cent in 40 minutes via quick charging (50kW), 5.5 hours via 7.5 kW charger, 8 hours via 6 kW, and 16 hours by a 3 kW domestic supply. The new Nissan LEAF's battery can not just receive energy either, with the car maker referring to it as a "mobile power unit complete with unique bi-directional charging." This functionality allows the car, when not in use, to cycle its stored energy into a local energy network (such as someone's home or office) or, in the case of excess charge, the local energy grid. ProPILOT, which T3 first went hands on with over a year ago, is arguably the other major addition to the new Nissan LEAF. The technology, which is a collection of driver assist systems that help the driver within single lane, low speed traffic and cruising scenarios, can automatically maintain lane, slowdown and stop, start again, and then continue following the vehicle in front at a safe distance. Nissan's vision for ProPILOT is to make drives in these scenarios more stress-free and comfortable for the driver. In addition to this functionality, ProPILOT also delivers fully autonomous parking in the new Nissan LEAF. 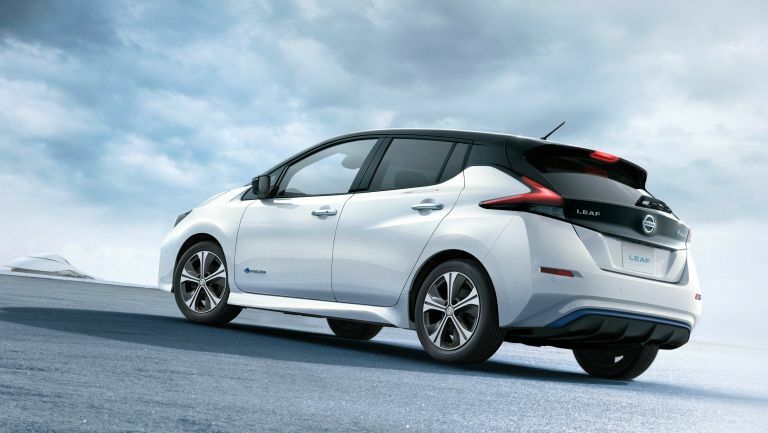 In terms of cosmetics the new Nissan LEAF has also received an overhaul. A new sleeker profile gives a sharper, more dynamic look, while also ensuring excellent aerodynamics. The company has been careful to maintain its most notable design characteristics though, with its traditional boomerang-shaped lamps, V-motion flow in the front, flush-surface grille in clear blue and rear bumper’s blue moulding remaining in-tact. Inside the cabin is focused around a new full-colour, 7-inch, TFT display, which displays an array of key features including Safety Shield technology, power gauge and information from the audio and navigation systems. Depending on the individual market, Apple CarPlay and Android Auto have also been integrated for enhanced connectivity. Lastly, in celebration of the new second generation LEAF being unveiled, Nissan has also revealed a unique, special edition version of the car, which is on sale from today. Named the Nissan LEAF 2.ZERO, this version of the car is the first model in Europe to be fully equipped with ProPILOT and is priced at £26,490.